The task „Gaskets, Connector, and hardware“ is only available for a detailed estimation. Here you determine whether the additional items are assigned to the individual insertions or will be given out in one position at the end. „Summary print/display“. The summary shows all positions of your estimation sum again and gives you the total sum with and without value added tax. In the estimation’s annex an evaluation of the entire object can be printed out. 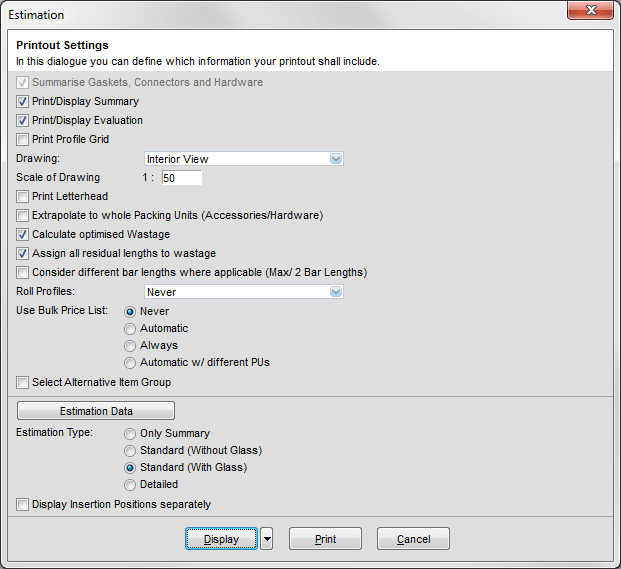 Select „Evaluation print/display“. In the estimation a drawing is printed for each position. You determine in which dimension and scale the drawing shall be printed by selecting „drawing interior view“ and „scale of drawing“. In addition to the drawing a schematic grid of the position can be printed by selecting „“print profile grid“. This grid shows which profile is positioned where for example. Once the option „print letterhead“ is selected, the preassigned letterhead will be prefixed in the printout. If the tab „calculate optimised wastage“ is activated, the optimisation is automatically started prior to the estimation and the optimisation is transferred into the estimation. The tab „assign all residual lengths to wastage“ determines whether the optimization’s residual lengths – starting at a particular length – shall be added to the wastage. “Calculate special lengths” asks for, or determines special lengths. Please observe the following instructions reference optimisation. The tab „profile division“ only influences the estimation’s result if your profile supplier delivers his profiles in half scales and the half scale’s information has been entered into the database. „Bi-coloured“ means that only bi-coloured profiles are separated into half scales and thermal breaks. „Always“ means that all profiles are split and „never“ that the profile price is used for the non split profile always. Nevertheless in case of bi-coloured profiles the surface area of the individual scales is used. With „estimation type“ you determine whether each position is given out in its regular amount with sum listing or with a detailed estimation. In the detailed estimation every item, every profile, and every glass will be listed with its price.